Since the rapid innovation of mechanical technologies that marked the Industrial Revolution in the 18th century, very few points in the history of Western civilization approach the intensity of this early burst of rapid and world-changing scientific development. Though scientific progress has been steady since the Industrial Revolution, there are a few historical periods which come close to its breakneck pace of scientific discovery. The years leading up to the First World War are arguably the next greatest period of scientific discovery to date. Prompted by the threat of global conflict, scientists in every corner of the globe scrambled to develop tools, weapons, and technologies that would give their respective sides an edge in what would become an unprecedented global war. Aerospace and maritime technology advanced by leaps and bounds in this period, not only in terms of the equipment that was developed but in the ways that these never-before-seen technologies were applied. The British Navy, in particular, was determined not to lose its historical advantage as a result of global technological advancements. 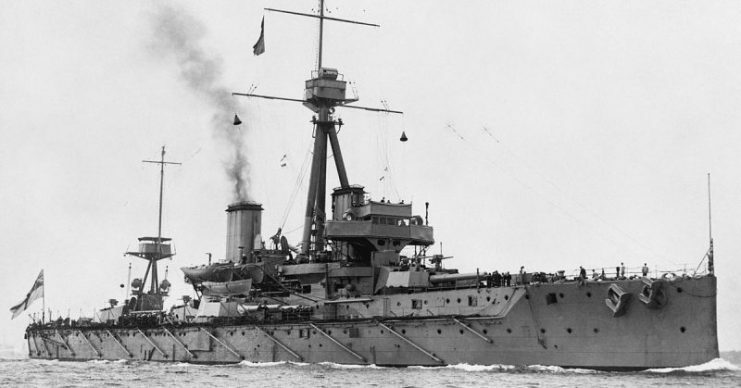 The Royal Navy’s HMS Dreadnought, launched in 1906, was the culmination of the period’s greatest naval warfare technologies. It was powered by the recently invented steam turbine, a first for a ship of its size. 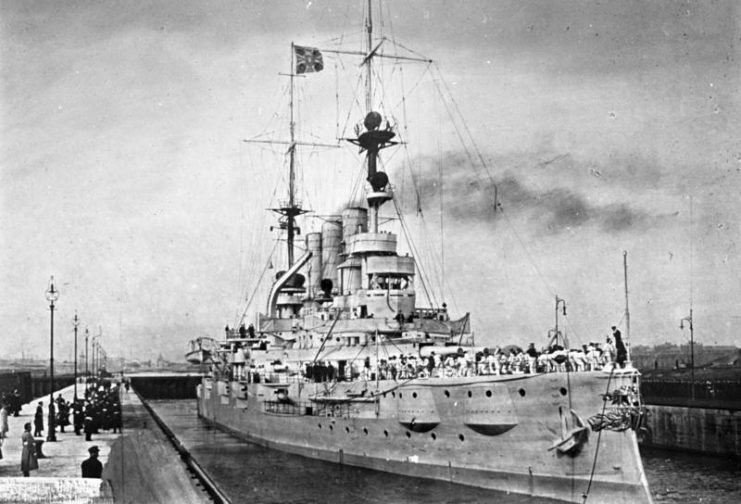 It was the fastest battleship in the world at the time it was launched. Not only was its speed remarkable at 21 knots, the range and accuracy of its weapons had been augmented, too, by a newly-developed electronic range-finding system as well as numerous other improvements to their firing system. Its heavily-scrutinized development and trials would not only spur a naval arms race that continued throughout the 20th century but raised broader strategic concerns for the English as well as their opponents. The rapid developments in naval warfare technology that would follow were as disruptive to military strategists as they were advantageous. As new weapons and propulsion systems were developed, new strategies were required to guarantee their successful application in combat. 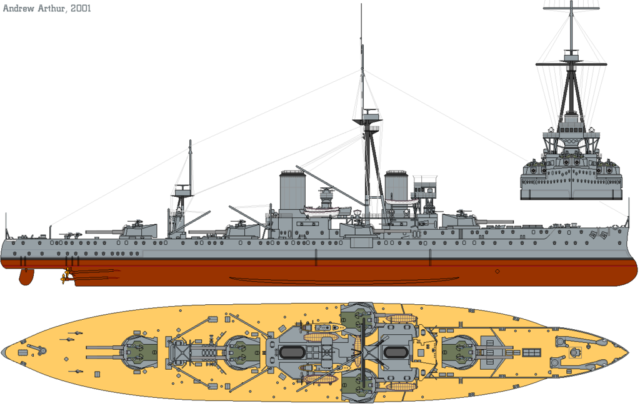 As it became possible to concentrate more speed and firepower into single vessels, strategists began to debate the merits of constructing fleets of vessels like Dreadnought versus smaller fleets of even larger and more powerful vessels. 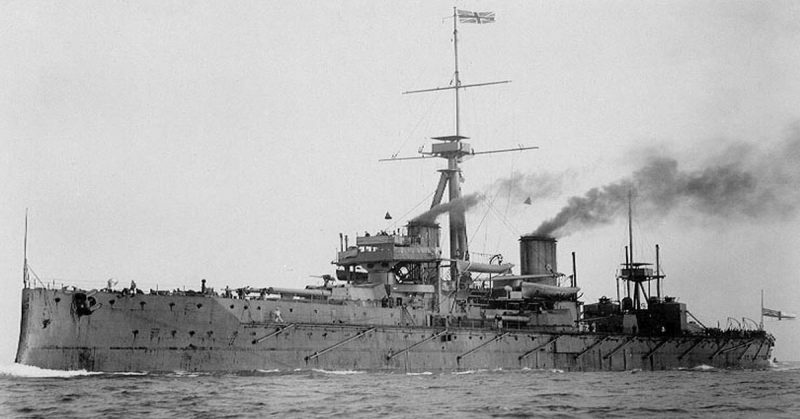 After the launch of Dreadnought, it was decided that the Royal Navy would continue to develop ships in larger numbers rather than in larger sizes with greater firepower. 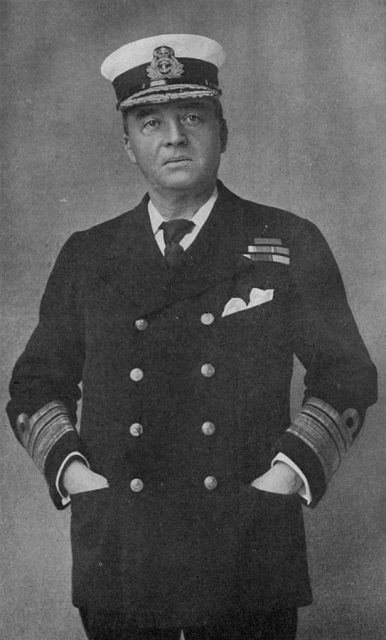 A committee, which included then-Captain John Jellicoe, opposed the recommendations of Admiral Sir John Fisher, who desired further concentration of power into fewer, single vessels. Their choice was more practical than philosophical. According to Lanchester’s research, numerical advantage was a more effective predictor of victory than the quality of individual vessels. In simple terms, the power of a fleet was not proportionate to the number of vessels it contained, but to the square of that number. In ideal, controlled situations in which two forces were fully engaged with one another (all ships are firing and receiving fire simultaneously), the side with numerical superiority is more likely to win as the offensive capability of the other side will decrease at a faster rate. 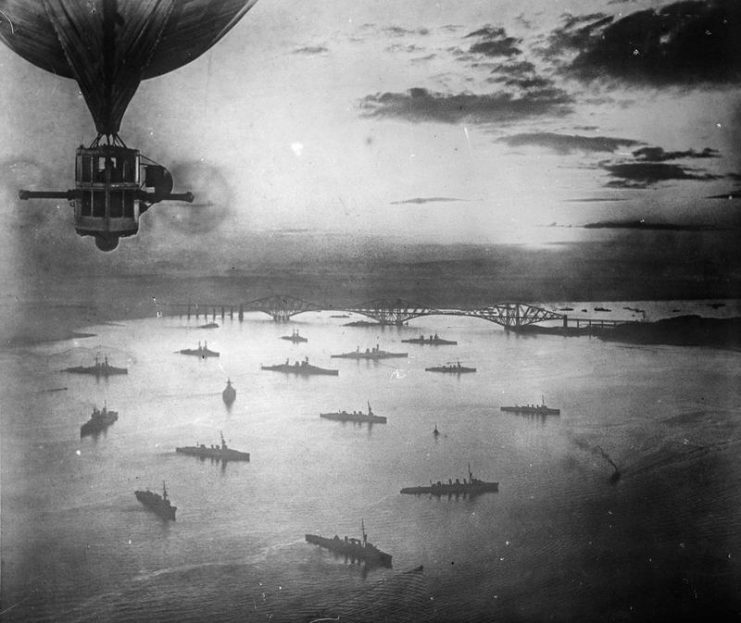 Although Lanchester’s equations factored in modifiers and coefficients for measurable differences in the offensive and defensive capability of opposing forces, the math was sound: numerical superiority outweighed technological superiority within the range of technologies that was employed by the English Grand Fleet and the German High Seas Fleet. 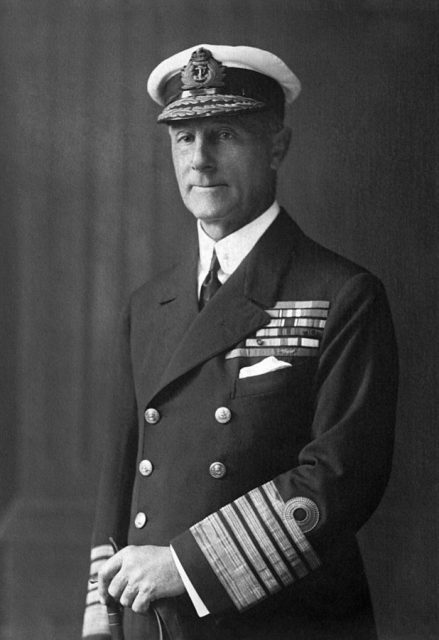 It was with Lanchester’s research in mind that Jellicoe, now an Admiral, engaged a smaller but technologically superior German fleet at the battle of Jutland on May 31, 1916. The Grand Fleet, traveling in rectangular formation, was quickly reorganized into a long line of vessels. This allowed all British vessels to fire upon the enemy simultaneously – a crucial element of Lanchester’s mathematical predictions. 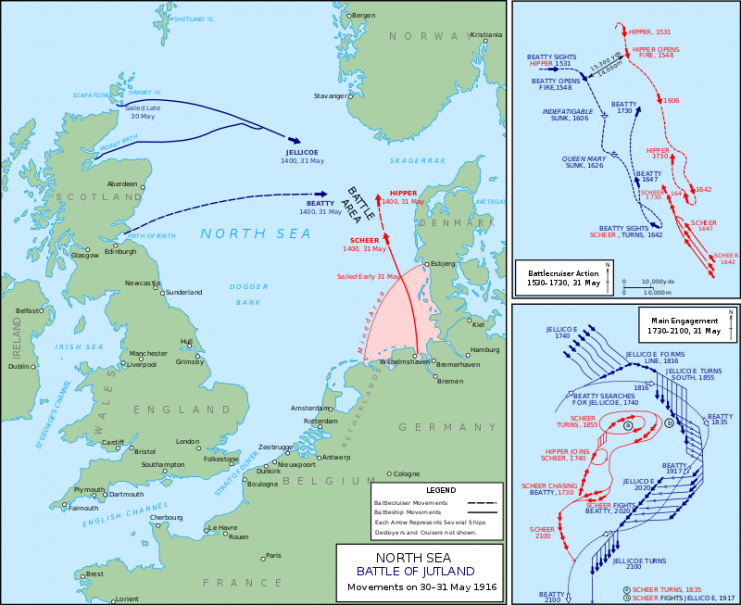 The British lost three ships and over 5000 lives in their maneuvering, but their victory was decisive. The German fleet, though it possessed superior firepower, realized its disadvantage and fled. 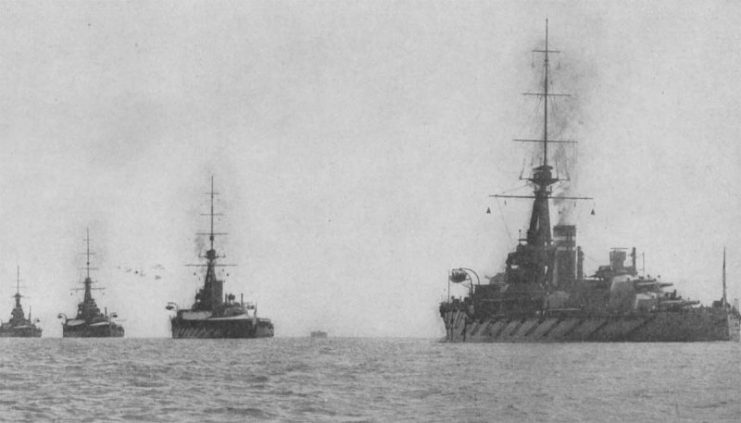 The 2nd Battle Squadron of the Grand Fleet in 1914. Jellicoe’s maneuvering proved that the ideal conditions of Lanchester’s theories could be successfully recreated to organize warfare within the engineer’s mathematical parameters.